The tenth of May, we left safe, comfortable, and convenient Georgetown behind. For most cruisers to the Exumas this is their last stop and turn around point. Few people venture further south(east) and when we met one of these “brave” souls, any information was more than welcome. Soon enough we felt as if we were leaving civilization and with that the congregation of other cruisers. We also realized that safe, all protected harbours became inexistent. Irie would be mostly heading into the winds from now on, so weather forecasts became even more important. The day we left Georgetown and its Elizabeth Harbour, it was dead calm. The Sound was as flat as it could be, showing the bottom of the ocean for a long time. No ripple on the water, just a trail behind the boat, created by one of our engines. The sun was extremely hot and soon enough, we missed the breeze to cool us and the dogs off. The only solution we came up with during these uncomfortable six hours, was to throw a bucket on a line overboard, fill it up with seawater and rinse dogs and humans off with the refreshing water. And repeat. It helped some. Seawater does come in handy once in a while. At least that’s something we have an unending supply off! Don’t try to cook pasta in it, though… Waaaaaaaay too salty! During this trip, we also had our most wonderful and special experience so far. Mark spotted a few dolphins in the distance. After a while they seemed to swim towards us. They came closer and closer, stopped in front of one of the hulls, waiting for their friends. 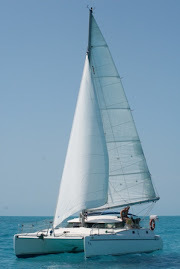 Then, all six of them, in formation, glided in between our hulls and swam barely in front of the catamaran. Because of the flatness and clearness of the water, we could see every single detail on their bodies, and their big smiles. Only common sense told us that they were indeed in the water and not above it. It was as if we were watching these beautiful creatures on top of an aquarium. It was just awesome! I still regret not grabbing the camera before we walked on our trampoline. The dogs sensed our excitement and joined in the fun. That must have been too much for our show animals. They left as quickly as they arrived. Salt Pond in Thompson Bay became our anchoring place and base in Long Island. The island runs mostly north-south, but by moving around, it is possible to find protection from west and northwest winds, just not from the southwest. And where did the wind come from a couple of days later? Yes, the southwest. Of course we regretted not coming down from the Exumas that day, since we could have actually benefited from it and sailed… What a concept. Our friends Cindy and Gray were wiser. We tried to sit the bouncing and rocking out for a day and a night, before we decided to move to the north of the bay. It was still pretty uncomfortable over there, and taking the dogs to shore in the waves was a whole feat, but at least there was a beach closer by. Not too much later, the wind turned more to the west, giving us all some relief. Salt Pond has two good supermarkets with a lot of fresh produce, quite a pleasant surprise. Fox Auto rents cars and that was one of the main reasons we staged out of there. Together with our friends from Cindy’s Island, we rented a car for the day. This way, we got to see Clarence Town, the highlight of the island. Here we found two beautiful churches (one of which we climbed for a great view) and a couple of blue holes, right off the beach. After lunch, we swam in one of them –supposedly the deepest blue hole in the world (660ft). The area was very beautiful, with a white sand beach, shallow, warm sea water with waves crashing on the reefs in the distance, a picturesque rock wall rising along the water’s edge, and in the midst of it all, a big dark blue spot, where the water was cold and seemed bottomless. Very pretty! Long Island has a good vibe to it and we liked it a lot. Not very touristy, but also not too remote or boring with quite a few things to see and do. We didn’t feel inspired enough to check out the real estate offices, though. Instead, the day before we left Salt Pond, Mark and I washed the dogs, some clothes and ourselves at a well on the main land. Talking about primitive living! When we arrived in Calabash Bay, the wind came out of the southwest again, with a north easterly swell rounding the point. We decided to be uncomfortable in a new place, and uncomfortable it was… Taking the dogs to shore was a great and wet challenge, since we had to surf the braking waves onto the beach. Getting everybody safely back to the boat added to the adventure. Irie rocked all over the place (a catamaran produces very jerky movements) and by the time we had prepared dinner (freshly made tortillas which took forever to make round and flat; not recommended! ), I felt too sick to eat. The bumpy motion did rock us to sleep in a soothing manner.